Some players are on the verge of stardom, others are entering a crucial phase of their development and still others are getting their first tastes of full-season ball. With the 2019 season approaching, MiLB.com takes a look at the most intriguing prospects from each MLB organization. After a hamate injury limited him to 85 games in 2017, which would have been his first full season, Dalbec contended for the Joe Bauman Home Run Award last season with 32 dingers (four short of Pete Alonso, who won the hardware in a tiebreaker). 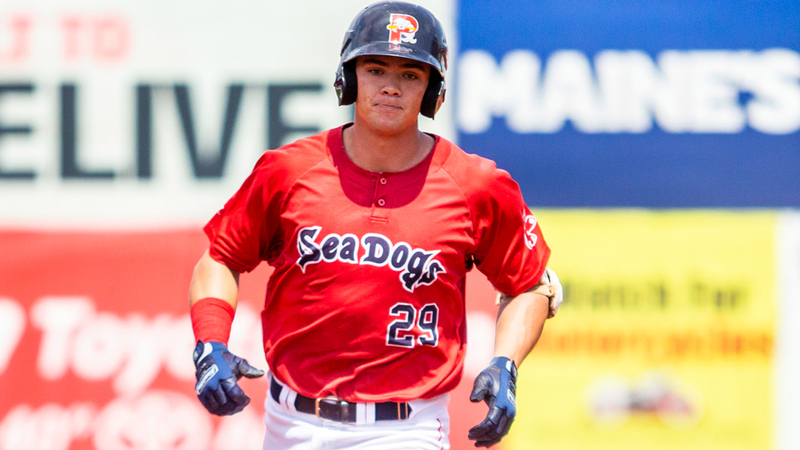 The 2016 fourth-rounder went yard 26 times in 100 games for Class A Advanced Salem and, following a promotion to Portland for his first taste of Double-A ball, cranked six jacks in 29 games between Aug. 4-Sept. 3. A trip to the Arizona Fall League produced three more homers even as he struggled to connect and focused on getting reps at a new position. All told, Dalbec showed he has the best pop in the system as well as a decent enough approach to make the power a threat at any level. "It's been a nice 12 months for Bobby," Red Sox vice president of player development Ben Crockett said. "It was an impressive season he put together last year offensively and defensively, and he carried that into the Fall League and got exposed to first base -- or re-exposed because he played there a little in college. And he was able to come into to big league camp and make a really positive impression. He's really professional and he has a plan in his daily work. He put together some good at-bats [in the Grapefruit League] even if the results weren't always there." This time a year ago, Chavis ranked No. 79 among MLB.com's Top 100 Prospects. He finds himself in exactly the same place after a season lost but for 46 games to a PED suspension. The missed time and surrounding questions dropped his stock, but his performance between Class A Short Season Lowell (five games), Portland and Triple-A Pawtucket (eight games) reaffirmed his potential value. He hit .298/.381/.538 with nine homers while showing an improved approach, then reported to big league camp in Florida to turn some heads this spring. "I think when he came back last year, even though it was a shorter period of time, he had a better feel for what he was doing in Double-A, and that carried over to Triple-A. He was able to drive the ball the other way in a way he hadn't done consistently before," Crockett said. "And he's hitting home runs to all fields, including into the bullpen at JetBlue Park, which is not easy to do for right-handed hitters. Overall, he continues to take strides and he should really be on the Major League radar in Pawtucket." Howlett fell to the 21st round of last year's Draft after a subpar senior season at his Florida high school, but when he got to the Rookie-level Gulf Coast League, he raked like a top pick. A vision problem, it turned out, was behind his struggles and after that was corrected his compact swing and easy power had him light up the GCL to the tune of .307/.405/.526. "He's a really good athlete. He has a nice right-handed swing, a good feel and a good approach," Crockett said. "He drives the ball to all fields and he's really competitive. It was a pretty impressive ease of transition to pro ball from high school." At 19 years old and with a total of 44 Minor League games -- five as high as Class A Advanced Lowell -- under his belt, Howlett's not a sure thing to be with Class A Greenville on Opening Night, but he's making a pretty strong case to get there soon, if not right out of the gate. "On the whole, he's in a really good position," Crockett said. A few months younger than Howlett and even less experienced in pro ball, Casas wouldn't be behind any sort of timetable if he was held back in extended spring camp. But heading out to Greenville for Opening Night was a possibility as recently as last week and he's since appeared in a Grapefruit League game, so even if that doesn't happen, he figures to hit the South Atlantic League before long. Regardless of where Casas is on April 4, the important thing is that he's fully recovered from the torn thumb ligament sustained in his second pro game after the Red Sox drafted him 26th overall in June. He brought his 60-grade power to the organization's Dominican academy in the fall, then headed to camp in Fort Myers in February. "This is a great experience for him. He was here early for some preparation, and that's great to see," Crockett said. "But he's routine-oriented, a really hard worker. He prepares for every day, and as [he gets into Minor League Spring Training] games, we're excited to get him the opportunity to go and play." To some degree, Hernandez broke out last year. Pitching in his second full season, the 22-year-old southpaw was 9-3 with a 3.56 ERA and 124 strikeouts over 101 innings in 23 starts for Salem, then fanned 10 over six innings while allowing three runs -- two earned -- in five relief appearances for Portland. He followed that with a dominant stint in the AFL and a strong Spring Training. "He had a really good year ... and he's continued the trend," Crockett said. "He has three plus pitches and as he continues to refine his executions and ability to use any of his pitches at any time, he could really make impact." Although it'd be premature to dismiss him as a starter in the long term, if he keeps dealing it's conceivable he'll introduce himself to the Fenway faithful via a spot in the bullpen in 2019. Not a bad place to be for a guy who started last season in the Carolina League. More to keep an eye on: Jay Groome, the 12th overall Draft pick in 2016 who missed time with a lat strain in 2017 and had Tommy John surgery last May, resumed throwing in November. He "continues to work hard [on the rehab process] and at this point, that remains his focus," Crockett said. The 21-year-old left-hander was hitting the mid-90s with his fastball before being shut down and features a dangerous curve and promising changeup. ... Righty reliever Durbin Feltman has rocketed through the system at a speed befitting his 70-grade fastball (to say nothing of his 60-grade slider), climbing three levels after being selected in the third round of last year's Draft. As MiLB.com's Sam Dykstra wrote in February, he could come in handy for the Red Sox in no time. Feltman dazzled in his Grapefruit League debut, striking out two of the three Tigers he faced and ending the game with a pickoff. ... Outfielder Jarren Duran has the best wheels in the system and already has shown the ability to put the ball in play and hit for a high average, but Crockett advises against looking at the 2018 seventh-rounder as a singles- and doubles-only leadoff type. "He impacts the ball as well and I think he's going to have consistent extra-base power," the VP of player development said. "He continues to hone his approach and he's going to be able to drive the ball even more as he learns what pitches he can impact." ... Righty Tanner Houck experienced 2018 as a tale of two seasons. In the first half, reportedly at the suggestion of the Red Sox, he leaned on a four-seam fastball and had a 5.40 ERA with 41 strikeouts and 41 walks over 54 innings in 12 starts for Salem. In 11 second-half starts, he ditched the four-seamer, went back to relying on his two-seamer and posted a 3.13 ERA while fanning 70 in 63 1/3 innings. Even if he returns to Salem, it will be his time with Portland this season that gives him an opportunity to steal the spotlight and cement his future as a starter. Josh Jackson is a contributor to MiLB.com. Follow and interact with him on Twitter, @JoshJacksonMiLB. This story was not subject to the approval of the National Association of Professional Baseball Leagues or its clubs.